Aluminium Circular Louvre - Please contact us directly on 0161 336 5065 for bespoke products not listed as we specialise in made-to-measure vents and custom designs. Our circular external louvres offer a fantastic alternative to traditional square and rectangular louvres. 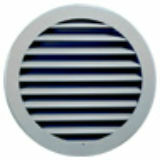 CVE Shop small diameter external louvres are designed for applications requiring a high free area external vent, perfect for bathroom extractor fans etc. When using circular ductwork or flex, the duct will connect directly over the louvre spigot without using a transition piece. Manufactured from cast aluminium, the louvre is very robust and rattle free. The circular weather louvre also offers excellent resistance to rain whilst maintaining a 50% free area. The circular weather louvre can be fixed through the face into the substrate (supplied undrilled), or by using the two concealed holes in the rear spigot. If the size you require is intermediate to the sizes listed we advise taking the next size up. Manufactured from cast aluminium featuring slimline blades on 20mm pitch. Rear vermin mesh constructed from galvanised steel. The standard finish is Silver Aluminium. Should you require an alternative colour we can powder coat your circular louvre to match any RAL/BS colour required. For other colours we offer a paint matching service, simply submit your colour details or send a small sample and we will do the rest. Air intake or discharge in domestic and commercial ventilation systems. Suitable for external use. At the rear of the louvre blades is a 12.5mm x 12.5mm galvanised mesh screen to prevent the ingress of vermin or foreign objects. All circular louvres are supplied with unpunched flanges but are suitable for face fixing or sidewall fixing into duct using the neck at the back of the louvre. -3mm smaller than listed diameter. E.G. CVCWL200 will connect to 200mm Dia duct with an actual spigot diameter of 197mm. If the louvre is being installed into an external wall opening, the opening must have a minimum diameter of 200mm. If face fixing the louvre, a maximum opening diameter of 210mm is advised.